I’m tired, it’s late, but I also really want to start talking about Raees with you guys! And I want to do it in a place where we won’t spoil it for those poor people who haven’t been able to see it yet. And thus, a mini-review! I still get to write and put up a better review sometime tomorrow, but this is just something to hold you over until then. Lil’ Shahrukh works for his local bootlegger in Gujurat, until his factory is raided. Lil’ Shahrukh talks his way into working for Atul Kulkarni (at least, that’s who I think it is, I can’t find him or his character on any cast list), the biggest bootlegger who only works in imported liquor, not poisonous country made. Jump forward some number of years, Shahrukh is fully grown and the top enforcer for Atul, but wants to start his own business. Atul humiliates him and gives him 3 days to raise the money to purchase from him. Shahrukh goes to Bombay to sell goats for Eid and while there runs afoul of the top mob boss in the area. But, the boss is impressed by his chutzpah and gives him the money to start his business. Success success success, and we also see that Shahrukh has a flirty relationship with local girl Mahirah, who he marries. But Nawazuddin, the new local cop, is giving them problems. Shahrukh gets the better of him, but he is getting over confident and Atul decides to take him out. Massive fight scene, Shahrukh gets the better of the assassin and has him killed. And then goes and kills like 7 guys including Atul in vengeance. Nawazuddin arrests him for this, and to get out, Shahrukh decides to run for office. He wins, but in the end his sense of responsibility is what brings him down. He spends all his money helping his neighborhood and to make more to pay back his debts, he takes a job from the old Bombay boss. Which turns out to be bomb materials hidden in gold cases. Shahrukh kills everyone in Bombay, and then goes home to turn himself in and let Nawazuddin kill him in an “encounter”. Phew! That was LONG! Okay, what are the big points I want to bring up right away? I know what the BIG BIG point is that I need to talk about, but I’m going to save that for the end. First, the guyliner. And the whole bearded traditional look, and just generally Shahrukh’s appearance. It was great, right? Except, I think he did have fillers or something put in his cheeks to make him look younger. And, while I loved his intro action scene, and both of the ones in Bombay, but the “Laila” one got a little over the top. And the one during Muharram got really bad at certain points. If it was a standard Rohit Shetty kind of movie, then I wouldn’t mind the physically impossible fight movies. But the rest of the film is fairly grounded, so it kind of stood out. Second, how AWESOME was Mahira???? She did a great job with her role (as I was expecting, after seeing her in Humsafar), a believable partner for him in every way. And it was a really great role! I can’t decide if we meet her in the middle of their romance as an artistic decision, or if they cut some scenes. But I could believe either way, because it was really cool to have Shahrukh this tough clever awesome guy, and then all of a sudden we see him take off his glasses and fix his hair and look unsure, and we don’t know why until suddenly Mahira shows up and we realize that this is his little routine. I also really liked how their relationship progressed. She was completely in control of their courtship, and some of the flirty moments later. Clearly, Shahrukh got off on giving up control to her. But then way at the end when things started to fall apart, we see how when it gets down to the wire, he is in control and she is okay with that. Third, what was up with Nawazuddin’s character? He’s one I’m really going to need to sleep on. I think maybe there was a progression in corruption from his side at the same time that Shahrukh was progressing in goodness? But I’m not sure. We see him constantly getting transferred for honesty. And then suddenly he is Superintendent of Police? There is also a moment towards the middle when it looks like maybe he has been sleepwalking through his latest job, until he gets a clue that Shahrukh might be involved, and that inspires him again. So maybe he is supposed to be going from a dedicated and excited cop, to a burnt out cop, to finally one who has learned to play the game? Is what Shahrukh wants to do to Yatras. Yatras are a political thing that all sorts of groups have done for all sorts of reasons. It could just be an image. But the image is a bunch of saffron wearing people supported by police going through a Muslim slum. And the residents of that slum being ready for it and slamming them down and pushing them back. Sure, at the end, we have the alternative wish fulfillment of him brutally killing the Bombay boss who ordered the bombings. So both sides of extremists get their punishments. But come on, when was the last time you saw a bunch of aggressively-coded Muslims just plain beating the tar out of a bunch of Hindu politicians? That CAN’T be “just a movie”, right? This entry was posted in Shahrukh and tagged Ending, Film Reviews, Plot, Raees, Recap, Review, Shahrukh, Shahrukh Khan, Spoilers by mredlich21. Bookmark the permalink. But, did you like it? Was it as good as you anticipated? It was good, but I think I may have to sleep on it before deciding if it was really really good. It definitely wasn’t like Fan or Dear Zindagi, where I came out knowing right away it was brilliant. This is what I’ve been waiting for — for you to help me put into context what this film is trying to say. Because there are a LOT of undercurrents among the “cool-looking” shotgun blasts and so on. I did not think about that parade melee as Muslim wish fulfillment. This could definitely be another in a long line of sneaking in a message past the censors by hiding it behind a literal smokescreen of flash and spectacle. I agree that this isn’t a “Great” film, and it’s one I have to see again to really absorb. And I don’t have the full context of Deewar to guide me either. I assume that was the film at the drive in scene — what did you think of that direct homage? Still — that guyliner is an awesome look for SRK. Mahira is a goddess, and I loved their relationship. I also was wondering how they did the makeup to try to make him look younger. I had not thought about cheek fillers. Did you also think his makeup on his skin in some of the later closeups looked — I don’t know how to put it. Like heavy makeup, but also like they used an airbrush or something so it looked unnaturally smooth or something. I don’t think the drive-in movie was Deewar, unless I am forgetting a scene from it. Maybe Kaalia? But it was definitely one of the many many Amitabh movies that were inspired by Deewar. Amitabh as the one outside of society who defends those within it. For the parade melee, the Ram Rath Yatras were the more obvious connection, but what with the Gujurat setting and all, I was also thinking about the 2002 riots, and that kind of wish-fulfillment of “why didn’t they organize and fight back?” Again, maybe I am reading into it, but considering Rahul Dholakia’s most famous previous film was about the 2002 riots, it definitely seems like a possible reading. First, when I saw it I LOVED it. I think it is an excellent film. Yes, some of the fight scenes are over the top and I would have preferred they be only realistic. We saw it with a bunch of high school boys of Pakistani decent (we asked them) and they loved it, so I think that crazy action was there for them. I think SRK’s performance was as good as Dear Zindagi and Fan. Different, but as good. Even in the love scenes, he never became Raj or Rahul. He never grinned or smirked. His smile rarely went all the way to his eyes. When He tells Mahira, “I’m so tired.” You can see the toll this life has had on him, even with its joys. That was acting at its best. I am so frustrated with the love poured on Dangal and even Sultan by critics and they wont watch SRK the actor, they just won’t. Mahira was just the best. I am going to slog through her other soap opera as soon as I finish Zindagi Gulzar Hai. I hope/wish/pray she gets a chance to do another film with him. She can hold her own in a way many of his other heroines do not. I loved the acting! Completely agree with you that Shahrukh created an entirely new character, one that was distinctly different in every second of screen time from anything he has done before. And that Mahira was more than able to match him, not to mention Nawazuddin and all the rest of the cast. Where I would grade it as less than a truly Great movie is in the things like the way the narrative didn’t seem to have a clear theme through out, the way some scene transitions were a little sudden, the way the timeline was a little confused at points (that baby should have been either much smaller or much larger). And there weren’t many visual moments that felt truly jaw-droppingly great to me. Dear Zindagi and Fan, I felt like there even beyond the performances, every other part of the film was just topnotch. This one (and Dangel too, since you bring it up), I felt like it was all around very good, but there were still flaws. I also wonder if some of the things I saw as “flaws” were because of self-censorship or other issues that limited the filmmakers ability to make the film they wanted. For instance, some of the shots of his neighborhood felt really “soundstage-y”. But then, I know they weren’t able to film in Gujurat as much as they wanted because of protests, so they had to make do with soundstages. And I strongly suspect that the real “theme” of the film is something about religion (I will have to think about it a little more to be sure exactly what), but they couldn’t make it is obvious as they wanted for fear of protests, so they threw in a bunch of extra stuff to confuse the audience. I’m seeing it a second time tonight, which means I can probably start the blow by blow (Ha! Literally!) review tomorrow. Yay! As we talked about before, I def think he had some kind of fillers or mouth pieces to fill out his cheeks, but judging by recent interviews and photos, it seems like it was temporary. Wonder if he has the slightly chipmunk-y look in photos from the Imtiaz Ali set? He was going back and forth between Raees and Dear Zindagi a bit, so if it was anything permanent, I would have expected to see it in DZ too, but I think he looked kind of “normal” in that one. Now that I’ve seen the film, it feels like he was supposed to be maybe 35 at the most at the end, right? He’s not playing a college student (thank goodness) so they didn’t need to do the crazy taping his face back and painting on the make-up effect like in Dilwale or Jab Tak. But maybe they thought some small fillers to widen his cheeks would help him look a little younger. And it kind of worked, I think, at least for me. That is, it didn’t look plastic and fake, if I hadn’t been so familiar with his regular appearance I might not even have noticed. And I could buy him as someone roughly in his mid-thirties, where as in Dear Zindagi he definitely looked and was playing close to his real age. I thought it was very good. Yes, in agreement about make-up to make SRK look a little younger – in the cheeks. 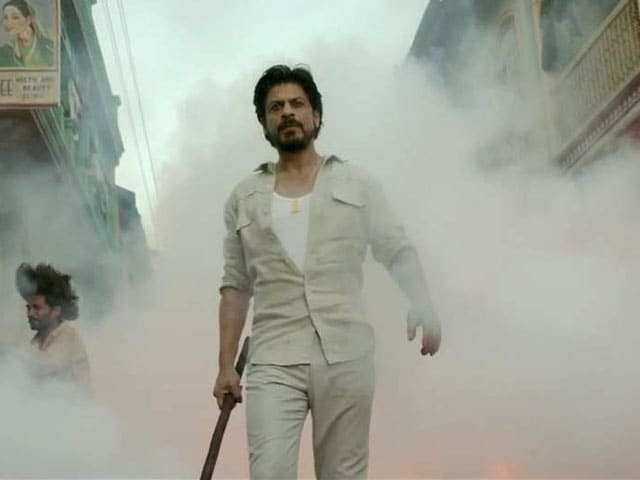 I was hoping it might have ended a wee bit differently – with Majmudar having a grudging respect for Raees, not shooting him, Raees doing time (a long time) in the clink and then coming in to the present day with Raees & Majmudar still having a grudging respect for one another. Or something. I just watched it a second time, and the ending seemed even more out of nowhere this time. There’s no grand arch leading to his fall, and Nawazuddin goes from reasonable and measured to vengeful and cold-blooded with no warning. I always want a happy ending, but in this case it doesn’t feel like just wishful thinking. It almost feels like the ending you suggest, or even Raees getting off scot free and becoming an honest real estate developer, could have made more sense than what we got. YES! I didn’t want to spoil the ending in my review but I was very troubled by it. NOW after all that defying his superiors for years does Nawaz do what they want and kill with no trial? It wasn’t an earned switching of places, with him becoming a bit corrupt, and the gangster all noble. I also didn’t like how the canny Raees gets duped so easily, seemingly, by the Mumbai gangster. After the whole press in the van meeting Nawaz to turn himself in — then the killing? I kept waiting for the biding his time in jail, earns Nawaz’s grudging respect kind of ending. Really, until the last 20 minutes, it felt firmly on course to have Shahrukh and Nawaz continue their cat and mouse game and have a peaceful ending. I’m guessing no, because Arjun isn’t Muslim and also doesn’t make as many headlines just by saying his name.